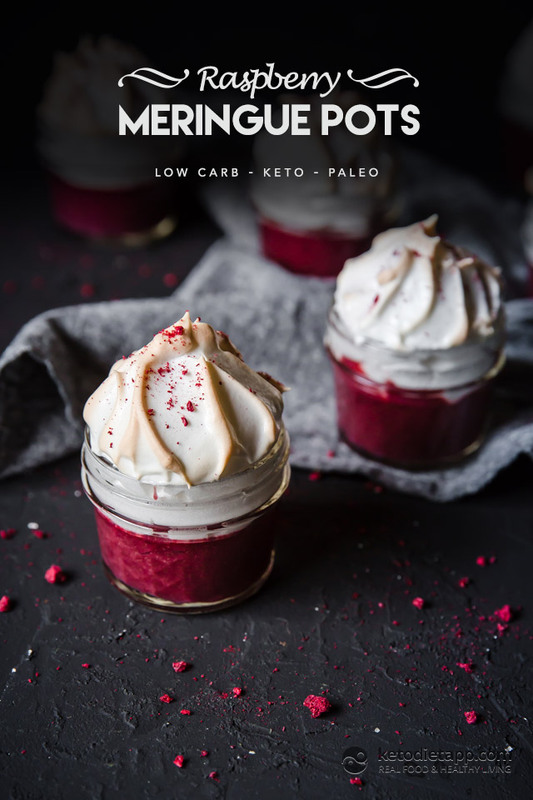 This keto recipe was inspired by our Low-Carb Raspberry Meringue Pie. I love a good pie, and that is one goood pie! But I also love pretty little glasses of desert, which have the added bonus of built-in portion control. It may seem like these are small servings, but this is so lush and sweet that you really won’t want more. It’s low in carbs, making this the perfect dessert for those who keep their carb intake low. It’s also low in calories and suitable for weight loss. 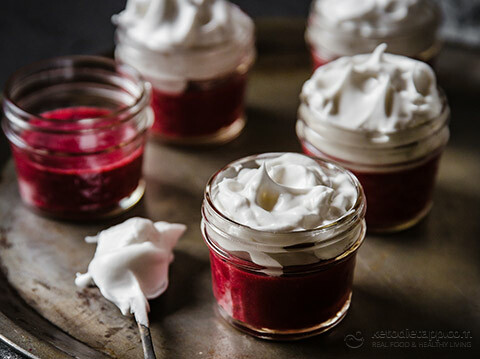 I also love that making keto desserts in jars like this means that I can pack them in lunch tins, if I feel like sharing. Enjoy! 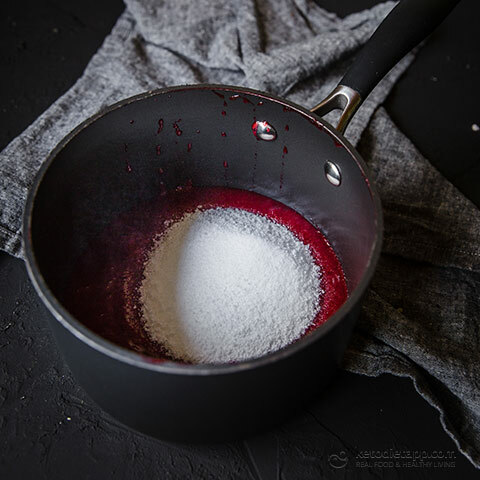 Place the raspberries, stevia and lemon zest into a saucepan. Add lemon juice and bring to the boil. Simmer for five minutes. 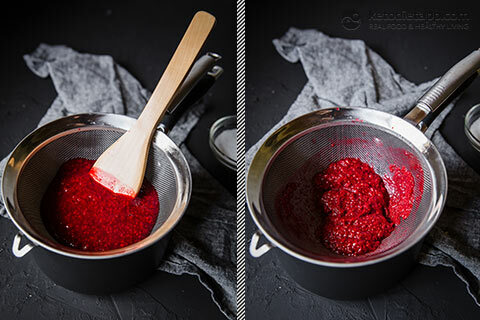 Place the raspberry mixture in a fine mesh sieve and push through until smooth, discarding the seeds. 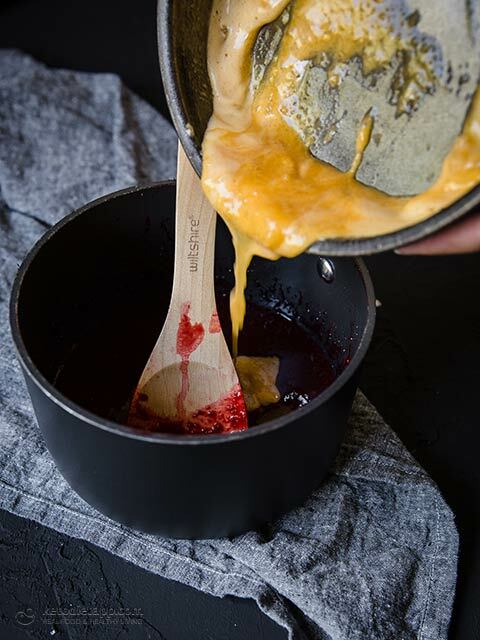 Return the raspberry puree to your cleaned saucepan, add the sweetener and set aside. 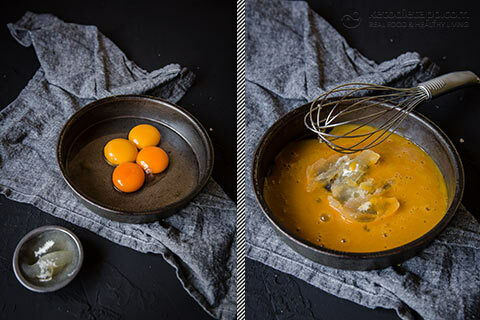 Separate the egg yolks and whites. Whisk the egg yolks and then add the bloomed gelatine. Whisk well until no lumps remain. 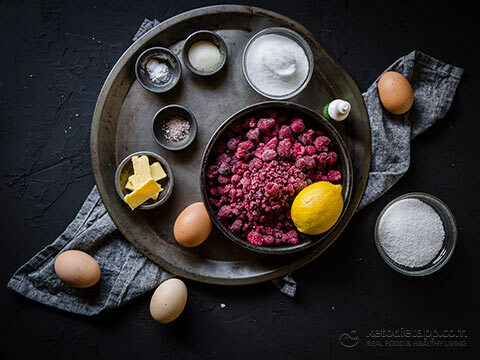 Add the egg yolk mixture to the raspberries and mix well. Heat over a medium heat until he mixture starts to bubble, stirring continuously. Once you see bubbles, remove from the heart, add butter and stir until melted. Set your glasses, jars or ramekins out (I used 4 oz/ 120 ml jars). 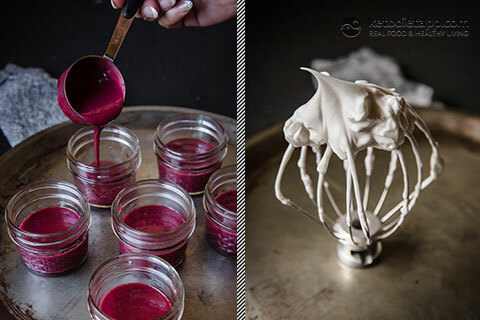 Pour the raspberry curd evenly into your jars and place in refrigerator to set for approx. 1.5 hours. Preheat oven to 175 °C/ 350 °F. Place egg whites in the bowl of your electric mixer and beat with a whisk attachment. Slowly add cream of tartar to whisking egg whites. One teaspoon at a time, add the sweetener, making sure to beat well in-between additions. Whisk until stiff peaks form. 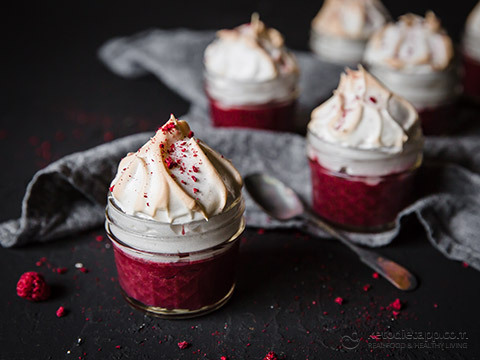 Remove set curd from fridge and spoon meringue on top, adding height and swirls to taste. Place on a baking tray and cook for approx. 15-18 minutes, until the meringue is browned to your taste. Remove and let cool. 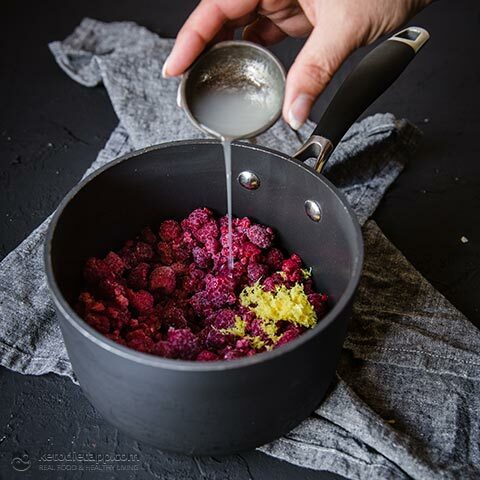 Crumble the freeze-dried raspberries on top for garnish. Return to fridge until ready to eat. Eat immediately if not able to cover. Otherwise, store covered in the refrigerator, for up to two days. Could monks fruit be used as the sweetener? Yes, you can use monk fruit sweetener to taste. 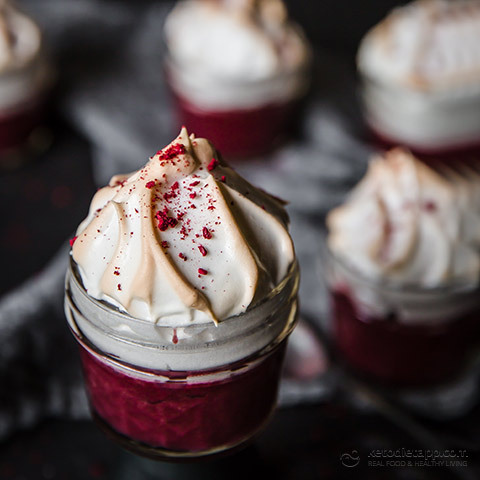 I love raspberries and I love meringue, so I knew these would be good! But I really can't agree with "It may seem like these are small servings, but this is so lush and sweet that you really won’t want more.". I had no problems eating the whole batch all by myself right after dinner the day I made them! Thank you Tobbe! 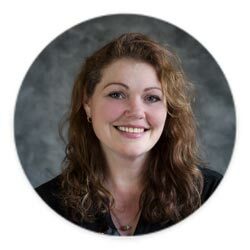 I have to admit you're not alone - I could easily have a double serving  Try making a simple no-bake "crust" by using some chopped or ground nuts mixed with cinnamon and butter as a base. This will provide more fats & protein which will help you stay you full for longer.